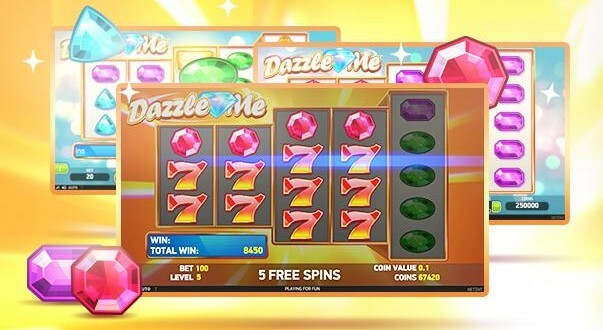 The Dazzle Me slot machine was developed by Netent and it is one of the many slot machines available in Kroon casino, which offers casino software from this provider, among others. This casino game immediately stands out with the design of its reels, because one of the reels has fewer symbols on it than the others. This game is unique because of this design and because of some of its other properties. This slot machine offers many ways to win with a fixed number of win lines. It also has several other exciting features. As mentioned, the Dazzle Me slot machine stands out with its reels and rows. You can see five reels, the first two of which each have three symbols and the two after that have four. The fifth reel is the largest with five symbols in a vertical position. There are 76 win lines on which winnings combinations may appear. The Dazzle Me slot machine offers several unique game characteristics, including free spins, dazzling wild reels and linked reels that are available in the free spin mode. This slot machine offers a pay-out rate of 96.9%, which is a fairly high average. The main game features the dazzling wild reels. The remarkable thing about this feature is that it can be activated at random times. When the dazzling wild reels are activated, the reels will be covered entirely in wild symbols, which can be recognised by the shape of a large diamond. Because these wild symbols can replace all other symbols except the ones that offer free spins, you can earn a lot of money when the dazzling wild reels are active. Another special feature is that the dazzling wild reels can activate on all five reels. When you see three free spin symbols, the Dazzle Me slot machine activates its special mode with free spins. With three symbols, you will get eight free spins. The number of free spins will increase as more free spin symbols appear: you will get 12 free spins for four symbols and 16 free spins for five symbols. During the free spin mode, the game’s reels are linked together. That means that two reels are connected to each other. All reels except the fifth reel may be connected to another reel. That means your chances of winning big are increased even more. Everyone can play the Dazzle Me slot machine in Kroon casino and choose between low, standard or high bets. The minimum amount is 0.20 euro per spin with a coin value of 0.01. You can bet a maximum of 200 euro per spin, with all kinds of variables in between. Other options of this game include the rapid spin feature.